Hemant is a software consultant at UtopiaSolutions with an extensive experience in developing test automation frameworks and enhancing them to test web, mobile, and RestApis applications. He's a ferocious reader and quick learner/ self-learner and helped his clients solving their QA hurdles with critical thinking and field knowledge. He's been using and promoting open-source projects to the clients for many years. 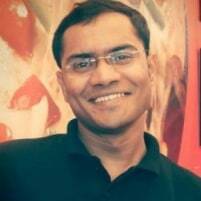 Hemant believes in giving back to the software community in any possible way. Have you seen any automated tests written in Hindi, Spanish or any other non-English languages? Have you added any test case to the suite for CI without check-in or commit? Have you worked on any code-less open source framework which enables you to write tests for Web and Desktop Applications? This session will cover a reliable and versatile framework concept we’ve developed and used successfully in-house. Currently, the concept is powered by a Java utility which has addressed all of our UI automated tests requirements with speed, simplicity, flexibility, efficiency and better control. We’ll see the demonstration of how one can write a test without any installation, configure it for execution and perform result analysis on HTML Extent reports on Jenkins. This application technology agnostic utility gives us the ability to write tests handled by Selenium and Sikuli, and can be extended to other automation APIs like Appium. Seamless integration with a CI server and capability to redirect executions to Selenium Grid on Selenoid hosted environments such as SauceLabs, BrowserStack, and simple local configuration provide incredible flexibility for executions. We’ll walk through the journey we took to get to where we are today. We'll discuss how tools like Google Sheets and its API has improved our efficiency in writing, managing automated tests in plain English. How real-time test management, collaboration, parallel execution, HTML Extent reports, logging and increased control has speed-up our contribution to the test suite. And, how we can work with security and agility. It uses ReadExcelsAnywhere utility which enables the user to read Excels stored on Sharepoint, Local or Google Drive. Hence, wherever you go, it will be with you. In this session, I’ll share my experience of building a robust and faster automated regression test suite, using Appium, for a mobile product made to give the same user experience on iOS and Android platforms. The story starts with what made us prefer Appium on other tools for all of our mobile automation projects. We’ll cruise through the out of the box and robust solutions to the many challenges we faced while achieving the goal of creating single script targeting executions on different devices of iOS and Android platforms. How we’re grateful to an open source project, which helped us in performing distributed and parallel execution on a local device farm and speed-up the execution. Together with the tips, how it helped in significantly reducing the execution time figure. At last, how developers and Test Automation Engineers learned to help each other in making life easier and worked together to the project success.